We look forward to taking care of you and your family. 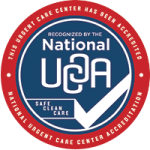 Our dedicated providers and staff treat your injuries and illnesses while offering the highest level of respect and compassion. We ensure to promptly forward your health record and treatment plan to your primary care physician to maintain continuity of your care. If you do not have a primary care provider, please consider our Platte River Medical Clinic for your primary care needs. Save time by downloading and printing our urgent care intake forms before your visit. If you are not feeling better within 72 hours of your initial visit, you may come back and be seen again at no charge. However, if the visit requires additional tests or labs, you will be responsible for those charges. We know it can be stressful waiting for a call on test results. As soon as your test results are available, they will be uploaded to your Patient Portal account. Along with test results, you will also be able to securely email providers and view notes from your visit. Click on button to login to your portal account or to sign-up.